All they needed was one stop. As bad as the Oklahoma defense performed throughout the day Saturday, in order to have a chance to beat rival Texas and keep their season undefeated, they needed just one last stop in the fourth quarter to give their potent offense a chance to win the game. Unfortunately for the Sooners, that stop never came as the Longhorns kicked a game-winning field goal with nine seconds left to beat the Sooners 48-45 at the Cotton Bowl. Texas ended the day with 501 total yards. Sam Ehlinger threw for 324 yards. UT came into the game averaging only 396 yards per outing. Their 48 points were 20 more than their season average as well. The Longhorns had their best offensive performance of the season against an Oklahoma defense that was supposed to be a strength this season. The Sooners entered the fourth quarter trailing the Longhorns 45-24. The game looked like it was done. But then OU seemed to flip a switch in the final 10 minutes of the game. First quarterback Kyler Murray hit Lee Morris for a 19-yard touchdown with 8:28 left on the clock. The defense came up with a stop to give the ball back to the offense with 5:11 left. On the first play of the drive, Murray sprinted 67 yards down the left sideline and into the endzone to close the gap to 45-38. For a third consecutive series, the defense came up with a huge stop and forced Longhorns to punt. The Sooners took over on their own 43yard line. It took only three plays for Trey Sermon to score and tie the game at 45-45. Kyler Murray suffered his first loss as a starting quarterback in college with his defeat at Texas Despite throwing for 304 yards and two TDs on `19-of-26 passing and leading the Sooners in rushing with 116, he put the loss on his shoulders with his two turnovers. 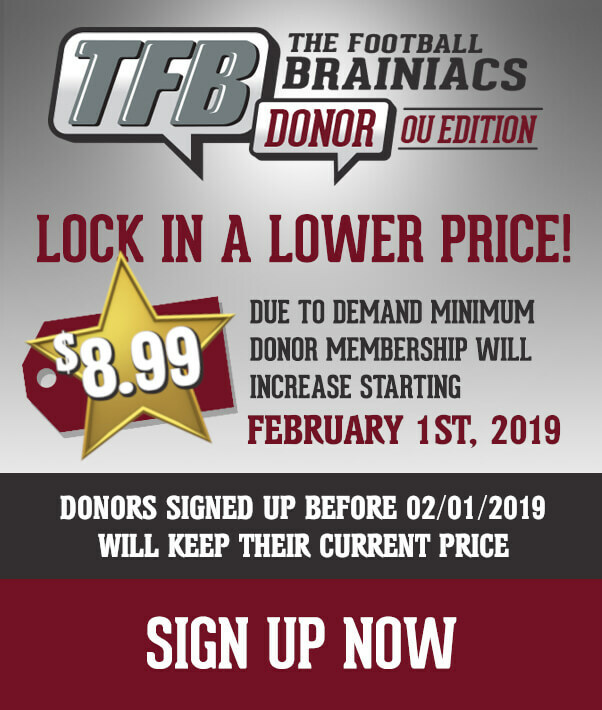 Marquise Brown snagged nine catches for 132 Yards and two touchdowns on the day. Lamb added six receptions for 75 yards. Curtis Bolton led the Sooners with 13 tackles. Kenneth Murray, who leads the Big 12 in tackles, ended with 10 tackles. Kahil Haughton added nine tackles. For Texas, Lil Jordan Humprey tallied nine catches for 133 yards while Collin Johnson tacked on 6 receptions for 81 yards. Keaontay Ingram led the Longhorns ground game with 13 carries for 87 yards. Oklahoma took the first lead of the game when Kyler Murray and Marquise Brown hooked up for a 4-yard TD pass on the game’s opening drive. However, UT outscored the Sooners 24-10 the rest of the first half. The Longhorns kept finding ways to putting the Oklahoma defense in positions it didn’t want to be in. On their second touchdown of the first half, quarterback Sam Ehlinger hit tailback Tre Watson on a wheel route out of the backfield on a 28- yard touchdown catch. He was being defended by defensive end/linebacker Mark Jackson, who was trailing him the entire way. On the ensuing drive, the Longhorns went on an eight play, 75-yard scoring drive as they rammed the ball down the Sooner’s throat with the run game. They were physically moving the defensive line off the line of scrimmage and back into the linebacker’s laps. Oklahoma responded with a huge drive right before halftime. It ended with Murray hitting a wide-open CeeDee Lamb in the endzone for a 5-yard TD pass. The Longhorns led 24-17 at halftime. The Longhorns came out of halftime like they started the game. They pulled out an 11-play drive that covered 75 yards. Ehlinger’s 5-yard touchdown run put Texas up 31-17. But the Sooner’s struck back with a 77-yard scoring strike from Murry to Brown. It’s the longest reception by a Sooner in the series. After Oklahoma forced a three and out on the next series, they got the back with a chance to tie the game. However, Murray fumbled while trying to evade pressure up the middle and the Longhorns recovered. 45-24 advantage heading into the fourth quarter. 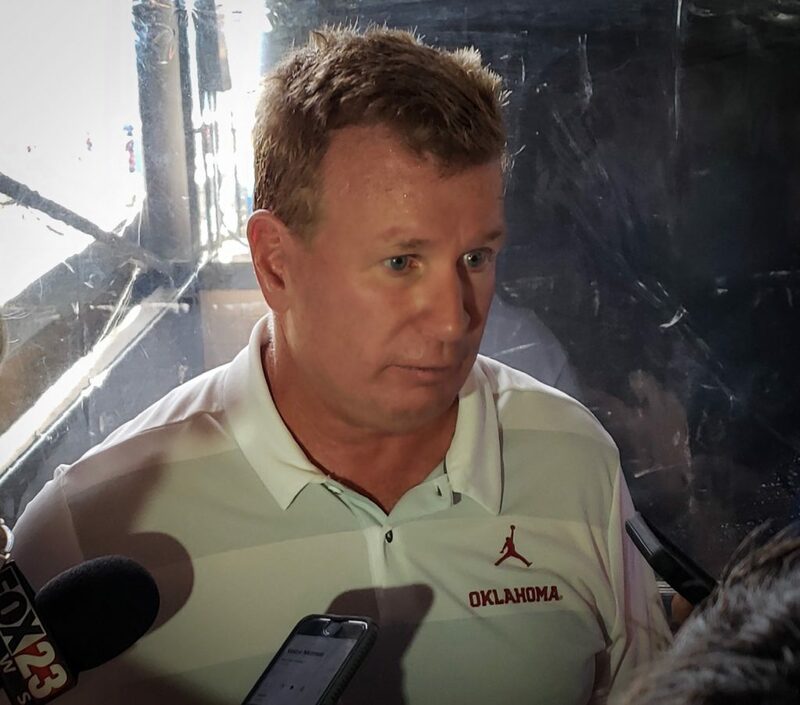 According to Defensive coordinator Mike Stoops and some of the defensive players, there seemed to be some issues with getting the right calls in from the sideline and not everyone playing the right defense.